August is the month for tomatoes at May Dreams Gardens. What generally starts as a trickle seems to rapidly turn into a deluge of tomatoes of all shapes, sizes, and tastes. I’m a traditionalist when it comes to growing tomatoes. I start my own seedlings indoors in mid to late March and plant them out in the garden well after the frost free date. I’m in no rush to plant the tomatoes outside, having once lost all my seedlings to a very late frost. And somewhere along the way I learned or got the idea in my head that tomatoes won’t grow at temperatures less than 59.5 F. I don’t know it is true or not, but I go by that. Of course I stake my tomatoes and try to grow them like my Dad grew his tomatoes. And I spend a lot of time waiting for the first tomato to ripen. While, I wait, I like to give my tomato plants the best care possible. Once the first tomato does ripen, I pull out all the stops and think of elaborate rituals to commemorate the day and the tomato. 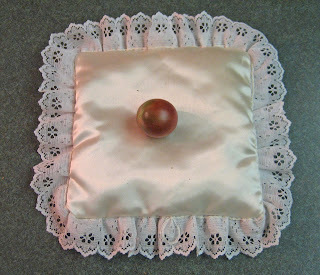 If you aren’t familiar with the ritual of the first tomato, I recommend, you right-click on that link, view in a new window, and let me know what you think. I assume all tomato-growers make sort of a big deal out of the first ripe tomato. There are rumors that I am competitive tomato grower. I think that rumor started last year when I claimed I had grown the smallest tomato possible. Or maybe it was this year when I decided I had grown the World’s Ugliest Tomato. Last year, a few gardeners did post pictures of smaller tomatoes than mine, but this year, no one has come forward with an uglier tomato than mine! I try to plant a variety of tomatoes, so I have some to eat for every occasion throughout the month of August, and all the way up to the first frost. 'Red Currant' It's very good on salads. 'Black Cherry' Though these are 'cherry' tomatoes, they taste more like a big tomato. 'Sun Gold' These are very sweet, like candy. 'German Johnson' This is my favorite "big" tomato. And my favorite way to eat tomatoes? On a bacon, lettuce, and tomato sandwich, of course. And that 'German Johnson' looks like it is the perfect size to make the perfect sandwich. For more posts about tomatoes, visit A Way To Garden, where we are celebrating all things tomato on Thursday, August 14th. Then don’t forget to post your blooms on the 15th for Garden Bloggers’ Bloom Day. Yes it’s been a month all ready! I'm looking forward to finding out what’s blooming in your garden. All your tomatoes look good to me since I am all out of tomatoes to make those wonderful BLT's I'm missing since the beginning of July. I sowed some seed last week for Black Cherry tomatoes and they have popped out of the ground already. I'll have another crop of tomatoes starting around November. Thanks for your always informative posts! My maters are coming in like a lion. I've had 6 today all by myself. A friend of mine gave me some Orzo mixed pasta. I cooked it up--sliced the maters--added the two together along with some Wishbone Italian Dressing and it was yummy. I had it lunch and supper. I've also frozen some and done salsa. I might get sick of them pretty soon. 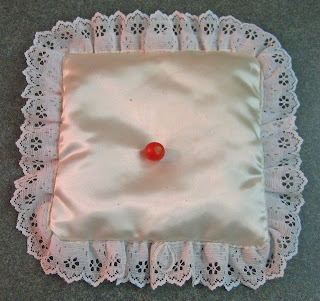 Carol, the pillow presentation is delightful! It makes sense that tomatoes would need warmth to grow...and it seems to be working for you...your tomatoes look delicious! If you have too many tomatoes send some to me! Yes, I have no tomatoes! 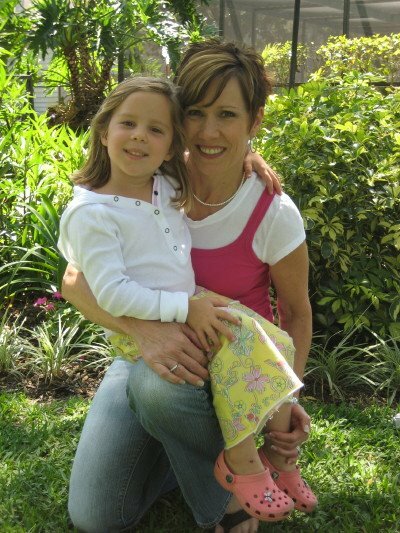 then surprise comes - that is fun. LOL. Lovely post Carol, I can't grow tomatoes outside because of blight so this year I have 4 plants in a small lean-too greenhouse. I have got some tomatoes but it will be a while before any are ripe, I just hope they don't get blight first. 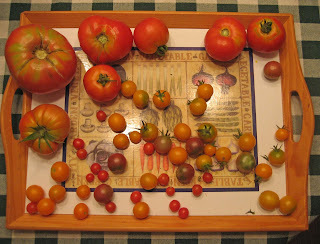 The only tomato you show that I've grown is "Sungold"--and it's my favorite. I wouldn't have described it as sweet as candy. I remember it as being lemony tart--in a very pleasant way (ie, not sour.) I like my tomatoes tangy. I'm intrigued by 'Black Cherry" and hope to try it some day. I grew Black Cherry last year, but swapped it out this year for Matt's Wild Cherry, and added Black Prince to fill in for the dark tomatoes. Matt's Wild Cherry is tiny and tasty - just bit larger than a currant tomato. 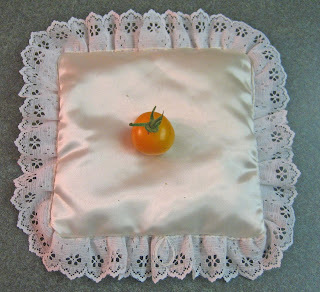 I hate to tell you, but photographing tomatoes on satin pillows qualifies as eccentric. I love it! This was a very entertaining post! I especially like your ugly tomato...I now realize that I simply do not visit your blog often enough! 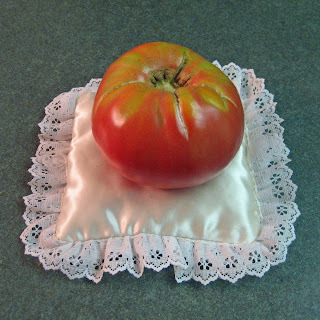 Haha - love the tomatoes on the little pillows!